Assassin’s Creed Odyssey is a very strange game to try to pin down. Among of all the Assassin’s Creed games—and there are 12 of them in total—it is the only one to not feature any actual assassins. In fact, it is basically a reskin of 2017’s Assassin’s Creed Origins with a few extra bells and whistles added on. Origins was a prequel to the entire franchise and gave an origin story to the Assassin Order. Odyssey, which takes place 400 or so years before the events of that game, seems to be setting up the importance and world altering power of the Order of Templars. Does this make it a bad game? Far from it. But what it does make it is a game with a bit of an identity crisis trying to do a little too much. Odyssey continues the quasi–open world RPG style set in place by Origins last year. However, unlike true open-world games like Breath of the Wild or Skyrim, the world here is broken up into zones with level recommendations. While this doesn’t necessarily restrict you in terms of where and when you can explore the map, it does handcuff you to certain areas for fear of being overpowered by even the most rudimentary enemies. The silver lining to this is that the story progression will only ever take you to level-appropriate areas with plenty to keep you busy, so the only reason to explore is your own personal sense of wanderlust. And while the open world may be hampered somewhat, every other aspect of Assassin’s Creed Odyssey makes sure you know that you are playing an RPG, as everything has a level. Your boots? Level. Your enemies? Level. The quest you just accepted? Level. The wildlife? Level. Throughout your time in this game you will be constantly inundated with numbers, and much like any RPG worth its salt, the higher the numbers, the better. While this does add a Borderlands– or Diablo-like angle of loot grinding to your adventure, always looking for that spear with slightly higher stats, it does sometimes make quest rewards obsolete too quickly. That amazing legendary helmet you just got for completing a major story chapter may very easily be made useless when you open a chest in a random cave to find a common helmet two levels higher. As I mentioned at the top, Ubisoft added a few new things to Odyssey to set it apart from Origins. The most immediately noticeable one is your ability to play as either a male (Alexios) or a female (Kassandra) protagonist, which plays out story-wise as either the son or daughter of an important Spartan general. Much like in Dragon Age or Mass Effect, your choice of gender creates no noticeable changes to gameplay; your stats are the same in both cases, as are your quest options and relationship possibilities. My female protagonist was able to romance an equal number of both male and female characters. It’s a welcome, albeit cosmetic, change that I would like to see in more story-driven games. Relationships, and your ability to initiate them, are also new additions to Odyssey thanks to a conversation wheel that appears while talking to most characters. Even though it is a new system, it is fairly simplistic, mostly equating to a choice of either diplomatic or violent responses to some quests as well as being able to romance some characters. Unlike in Dragon Age or Mass Effect, though, these “romantic” chat options will usually only lead to an additional quest or two before you’re given a very G-rated cut scene (and a PlayStation trophy). Another new feature introduced in this game is the Conquest Battle system. Basically every new territory you discover or explore in Odyssey is controlled by either the Spartans or the Athenians. By doing specific quests or killing certain enemies, you weaken the army that occupies a specific territory. Once that army has been weakened enough, you can choose to engage in a Conquest Battle that will change control of that territory to whichever side you have been assisting. A Conquest Battle is a Dynasty Warriors–style fight with many characters, both enemies and allies, on the battlefield. It ends after you have successfully defeated a number of high-ranking captains, or in some cases heroes, of the opposing army, officially changing who has control of that territory. My biggest issue with this system, and the entire Peloponnesian War subplot as a whole, is it has seemingly little to no effect on the game at all. You can enter one territory and flip control from the Spartans to the Athenians, then do the exact opposite one territory over, and it makes no difference. Understandably as a mercenary you are a third party with no major allegiances, but you’d think the Spartan army would be wary of accepting your help when you just handed them a decisive defeat minutes earlier. The final new addition I found during my time with Odyssey was the Mercenary System. People who have played Middle-Earth: Shadow of Mordor or Shadow of War will be immediately familiar with the this. Essentially a carbon copy of the Nemesis System, the Mercenary System operates exactly the same. During the course of gameplay, named and somewhat stronger enemies will hunt you down to claim the bounty on your head. This bounty is amassed by completing quests or killing targets that work against the interests of the army controlling that specific zone. Usually Mercenaries do nothing more than to extend a current battle or skirmish with enemy troops but are a fairly decent source of high-leveled or powerful gear. The biggest issue with Odyssey, one that the Mercenary System only manages to shine a spotlight on, is the distinct lack of the main character needing to be an assassin. While you can complete your quests by stealth, there is no penalty for rushing into an enemy camp, sword in hand, and fighting 10 enemies at a time. No quest is failed by being detected, and your targets will not flee when you approach them—rather every enemy in the game is all too ready to square up and fight you head on. My usual approach to any encampment was to stealthily pick off and assassinate as many enemies as I could until I was spotted, and then it was an all-out button mash until everyone was dead. Also, naval combat is back and largely unchanged from how it was in Origins aside from your ability to upgrade your boat and hire certain NPCs to your crew, with each offering a different perk. In fact, most of your world traveling will be done by boat, so hopefully your Origins experience wasn’t ruined by the few boat quests you had to partake in. All that being said, if you enjoyed Assassin’s Creed Origins, you will get more of the same with Odyssey. The changes and additions may not be enough to entice you if Origins wasn’t your thing, especially if you are an Assassin’s Creed purist and don’t enjoy the direction Ubisoft has taken with the franchise. But the setting of Ancient Greece is beautifully rendered and alive, and it’s filled with many, many things for you to do across its giant map. At least, as long as you avoid the game-breaking glitches that seem to infest every Ubisoft game—make sure to save often. 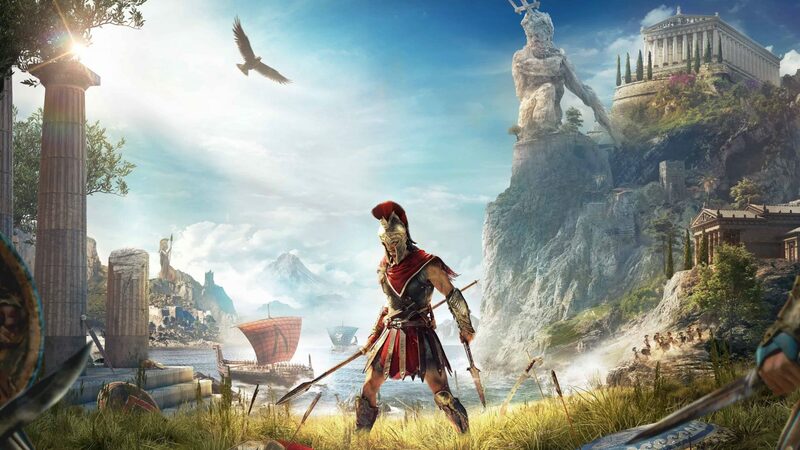 Assassin’s Creed Odyssey was released on October 5, 2018, on Microsoft Windows, Sony PlayStation 4, and Microsoft Xbox One, with a Switch edition announced during the Japanese September 2018 Nintendo Direct.